One of the most important factors in homeschooling is the way I approach each day. It's all about my attitude. Homeschooling 5 small people has its challenges. First of all, I'm very much outnumbered. There's 1 of me and 5 of them, at 4 different levels. (Thankfully, the twins work at the same level - most of the time.) Each of the small people require my attention/help/assistance during the day. There are only so many hours in our school day because we have activities in the afternoon - soccer practice, ballet rehearsal, etc. Instead of allowing myself to be overwhelmed by all of this, I have to make sure I approach each day with the right attitude. I only have a limited number of years raising each of my small people. In fact, my time with The Boy is more than halfway over before he heads off to college. I couldn't imagine giving any of that time to strangers for 6-8 hours a day if I sent them to a brick and mortar school. When things get difficult, I think about the benefits. The fact that I get to be the one who hears them read their first stories, who sees the light bulb go on when they finally understand a concept. I see the relationships building among the small people. Would they be as close if they went to separate classrooms all day? I don't know. But I do know that there would be far fewer moments when Soccer Girl sits down with Sassy Pants to help her learn her letter sounds and read simple words. Far fewer moments when we all start laughing hysterically over something The Boy says during history (an almost daily occurrence). I wouldn't change my days, as crazy as they may be sometimes, for ANYTHING! What do you do to make sure you have a good attitude? 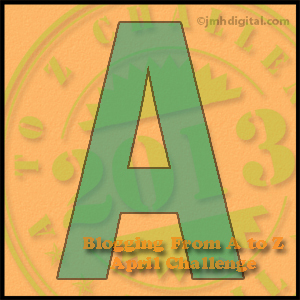 A is also for Arlee Bird, the founder of the Blogging from A to Z April Challenge. I think homeschooling must be incredibly difficult but also incredibly rewarding and I think if something is worth doing, you can't help but have the right attitude. Have a great A to Z month! It is both difficult and rewarding, with the rewards far outweighing the difficulties. A is for the admiration I feel for you and all homeschooling Moms. And with five kids, wow. I am kneeling in worship at your feet. I love my kids but I also love the break that school provides. Luckily they've both had wonderful teachers so far, who inspire and encourage them. Thank you! I taught in brick and mortar schools for 7 years before becoming a stay-at-home mom. I know that there are many wonderful teachers out there. I'm glad your children have had such good ones! Attitude is essential. I admire your perseverance. I did a similar thing in the 1070's, when my three children accompanied us around Australia in a caravan for one year. I wouldn't have missed the opportunity for anything. They learned so much from the new people they met and the Correspondance lessons along the way. Traveling around Australia for a year sounds like an amazing learning opportunity! I can only imagine how much they learned. Thank you for the great reminders! And...how important to address our attitudes as the teacher to our little one...sometimes it is easy to get caught up in their attitudes alone...we are blessed to be with the children God has given us! It is easy to get caught up in others' attitudes, isn't it? Children are a blessing! Oops...almost missed this (post didn't show as opening page). Thanks for visiting my blog and the follow! You have a beautiful family and a huge responsibility. Attitude is everything. Great start in the a-z. I'm your newest follower. I completely understand about keeping a good attitude by staying out of everyone else's mess. would say you need a great attitude to homeschool 5 kids - wow..
Hi TaMara, Yes attitude is so important for all of us, but as a homeschool mom myself, I know i had to work on my attitude before the Lord daily. I tried to teach my kids to have an "attitude A everyday." Now that the oldest is 24 and the youngest 12, I am blessed to have 5 kids of my own with pretty good attitudes. We all have our shortcomings and times when our attitude "A" stands for "anything but adequate," but for the most part, we count our blessings, give thanks to God, and keep a pretty up attitude. I have always said it takes a special someone to homeschool - hats off to you. Loved this post.